ASUS VZ239H-W has a space-saving design with an ultra-slim profile that measures a mere 7mm at its thinnest point. Its frameless design makes it perfect for almost-seamless multi-display setups that give you an even greater degree of immersion. An advanced high-performance IPS panel gives you an astonishing 80,000,000:1 contrast ratio and wide 178° viewing angles. 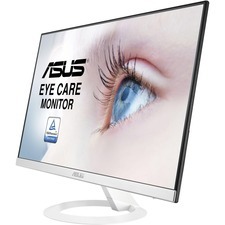 In addition, ASUS Eye Care technology ensures a comfortable viewing experience. VZ239H-W takes up very little desktop space and fits well in any setting, its ultra-slim profile measures just 7mm at its thinnest point. Whether you're playing games, watching a movie, or getting some work done, VZ239H-W's frameless design means two or three monitor setups are virtually seamless, giving you a panoramic display for an even greater degree of immersion. The TÜV Rheinland-certified ASUS Blue Light Filter protects you from harmful blue light, and you can easily access its four different filter settings via a hotkey. VZ239H-W has undergone stringent performance tests and has been certified by TÜV Rheinland laboratories, a global provider of technical, safety, and certification services, to be flicker-free and to emit low blue light levels. It's time to say goodbye to those tired, strained eyes. VZ239H-W features TÜV Rheinland-certified ASUS Flicker-Free technology to reduce flicker for a comfortable viewing experience. This technology helps minimize instances of eyestrain and other damaging ailments, especially when you spend long, countless hours in front of a display watching favorite videos.